Congratulations go out today to two of my favorite people in the whole wide world, Lara and Mike Smith, who I've been told are expecting their 22nd child. 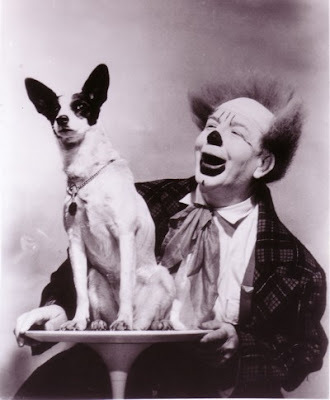 It isn't widely known but the reason that Kenneth Feld chose to close Ringling Bros. and Barnum & Bailey Clown College in 1998 was that extensive research informed him that, rather than training young clown hopefuls, it was actually more effective to begin his own specialized breeding program. 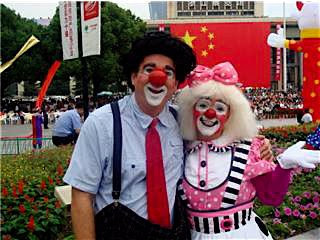 Mr. Feld selected his very funniest and most virile of male clowns and his very best female picture clown, had them legally married, and let them roam free to breed at his new Ringling Bros. and Barnum & Bailey Center for Clown Conservation in Kooskia, Idaho. 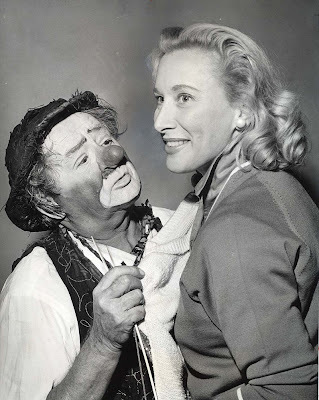 In this way Kenneth Feld was sure to have only the best looking, funniest clowns for the The Greatest Show on Earth®. Jay and Kristin Stewart have been breeding beautiful whiteface cubs in the wild in various locations on the east coast for the last few years. I believe that the plan is to team each of these rare whitefaces with the Conservation Center's herd when each set reaches peak comedy potential. A lifelong symbol of The Greatest Show on Earth®, the American circus clown is a respected and revered member of the Ringling Bros. family. In the interest of the species’ present and future well-being, the Ringling Bros. Center for Clown Conservation was established in 1998. Located in Kooskia, ID, this 200-acre, $5-million, state-of-the-art facility is dedicated to the conservation, breeding and understanding of these amazing performers. Endangered species? Not if we can help it. 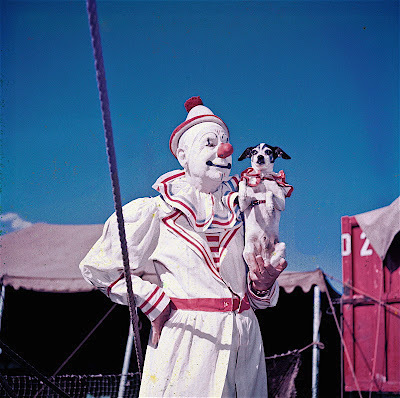 With only a small handful of professional American circus clowns remaining in the world, circus historians and bloggers agree that it requires programs such as the Ringling Bros. Center for Clown Conservation to ensure the American circus clown population is guaranteed a long and safe future. Threatened by the severe habitat encroachment of "featured clowns" (also known as "power clowns") in their usual spots, the Ringling Bros. Center for Clown Conservation provides a safe, healthy environment where American circus clowns are secure and comfortable. Our breeding program is one of the most flourishing of its kind, with twenty one births thus far. Built upon the 137 years of experience and expertise of working with circus comedians, the Ringling Bros. Center for Clown Conservation has become a global focal point for the study of American circus clowns. The Ringling Bros. Center hosts researchers, academicians and conservationists to create new dialogue focused around clown care, conservation and health and to exchange knowledge. Experts from around the world visit the Ringling Bros. Center to study the American circus clown, including Dr. Bruce Banner, Professor at Oregon Graduate Institute of Science and Technology, Dr. Nick Riviera, American circus clown expert and "Zippo", Belgian Party Clown and Chotchky Collector. Why the Ringling Bros. Center for Clown Conservation? With less than a handful of American circus clowns left in the American circus industry, and the opportunities outside of production numbers of those in the wild increasingly threatened, captive breeding programs like the one at the Ringling Bros. Center for Clown Conservation are vital to the future survival of this amazing species. 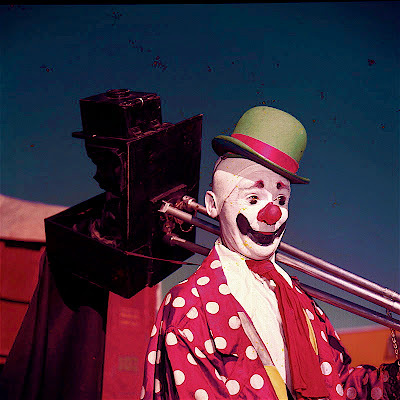 "A concerted effort to save the American circus clown is imperative. Cruise ships and China trips are doing their best with the resources they have, but most can't afford to maintain a large breeding group of clowns. The Ringling Bros. and Barnum & Bailey Center for Clown Conservation is dedicated to saving the American circus clown and has both the resources and the commitment to succeed." Ringling Bros. clown trainer Rusty Shackleford explains, "Because of the long tradition we share with our clowns and their integral role in our shows, it's important for Ringling Bros. to create entertaining and learning experiences for families to see first hand how intelligent these magnificent American circus clowns are. The kids here today will never forget seeing an American circus clown up close and personal and for a lifetime will have a better sense of our shared responsibility in protecting and caring for clowns, especially those who are whitefaces." A insightful interview with Bindlestiff Co-founder Keith Nelson by Christopher Lueck. Video Tape by Jim Moore. Keith talks about his life on the road and starting a Cirkus company in the worst time in NYC's history. Otto Griebling with wire service reporter Lee Belser in 1958. 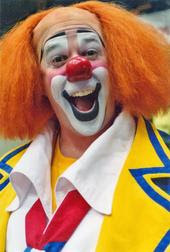 I just got back home from my Clown Doctor duties at Jersey Shore to find that, in the very short month of February clownalley.net has already received over 10,000 hits and almost 22,000 page views for the month. 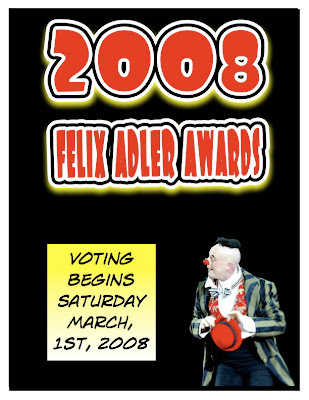 Voting will begin in the 2008 Felix Adler Awards this Saturday, March 1st, 2008. 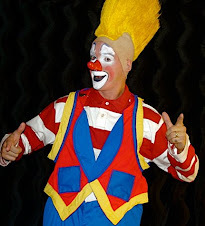 1) The FELIX ADLER AWARDS are given to American or foreign circus clowns working in the United States of America between January 1st and December 31st, 2007. 5) Information of how to cast your ballot will be announce tomorrow morning. The Red unit opened in Cincy today. I'm hoping to get word to Bello that Joe's ill. They're good friends. 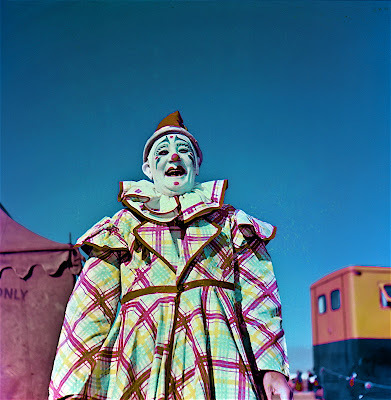 Please pass the word that one of the last great American clowns of the past is ailing. 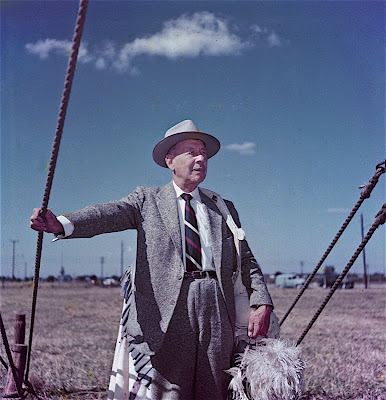 More from the Janette Rainwater series; here's someone that I know almost nothing about other than that he spent several years with the Ringling Bros. and Barnum & Bailey Circus, Walter Guice. Another performer that I have no biographical information on, Carl Stephan. 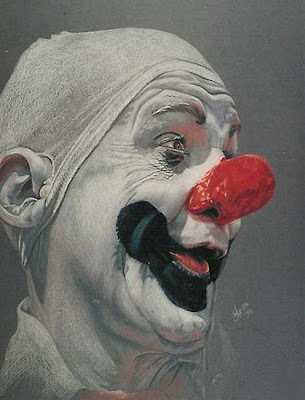 New York Downtown Clown offers 2 workshops in March! across the street from The Public Theater.) Studio 4E, on the 4th Fl. #2- Slapstick Dojo Starting March 5th! As seen in BACKSTAGE Summer Training Spotlight! silent films, circuses, and contemporary physical comedy. Class taught by Joel Jeske and Christopher Lueck. WHEN: Every Wednesday of the year from 6-7pm, Starting March 5th,2008. WHERE: West Side Dance Project - 260 W 36 Street, 3rd Floor. FEE:$15 per class or $50 for a month pass. An udated photo that looks to be Chester Sherman minus his longtime partner Joe, performing a verbal gag into the mic on an outdoor dates. 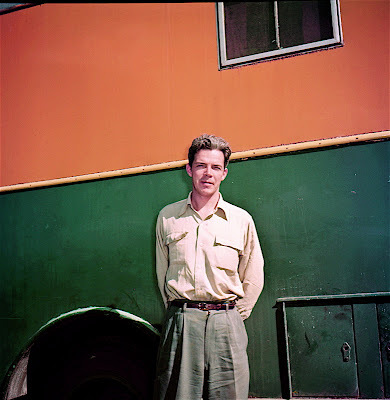 More of Janette Rainwater's portraits of the 1954 Ringling Alley, these of William "Bill" Hanlon. 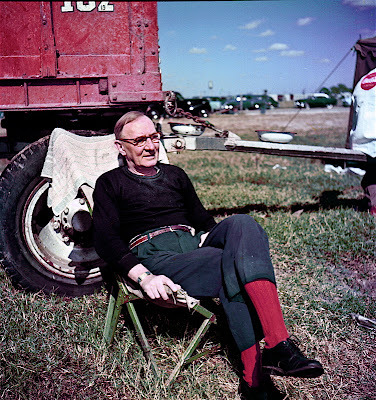 Bill, and his brother Fred Hanlon were descended from the famous Hanlon-Lee family of comedy acrobats. A group of pre-Vaudevillian acrobats founded in the early 1840s, the Hanlon-Lees were world-renowned practitioners of "entortillation" (an invented word based upon the French term entortillage, which translates to "twisting" or "coiling") – that is, tumbling, juggling, and an early form of "knockabout" comedy (later popularized by such groups as the Marx Brothers and the Three Stooges). The troupe consisted of the six Hanlon brothers and their mentor, established acrobat Professor John Lees. Originally billed as "The Hanlons," the group debuted in 1846 at London's Theatre Royal Adelphi. At this time, the company consisted of George, William, and Alfred Hanlon, who were essentially wards of John Lees until his death in 1855. 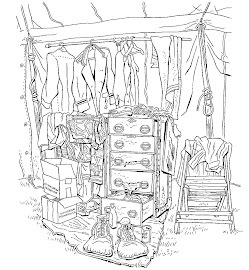 After his demise, the Hanlons returned to England and enlisted their younger brothers – Thomas, Edward, and Frederick – and rechristened themselves "The Hanlon-Lees" in honor of their fallen friend and instructor. The newly expanded troupe made its American debut in 1858 at Niblo's Garden in New York City, and spent the next four decades touring the United States and Europe. As their skills improved, their performances became more elaborate. When Jules Léotard introduced the trapeze in 1859, for instance, the Hanlon-Lees quickly adapted to the new device; their next production, Le Voyage en Suisse (A Trip to Switzerland) contained an aerial juggling sequence that stunned Emile Zola, who expressed utter astonishment at the vast number of airborne objects. 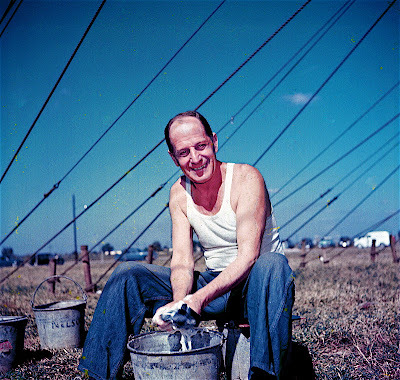 The Hanlon-Lees also patented several inventions, including the aerial safety net and a wooden brace used in the construction of scenery (which is to this day referred to as a "hanlon"). Despite the death of Thomas in 1868, the group continued to perform regularly until the early 1900s, at which point George Hanlon's sons Will and Fred assumed control of the company's repertoire. They would carry the company successfully into the 20th Century, going so far as to appear on film for Thomas Edison in a production entitled Fantasma. 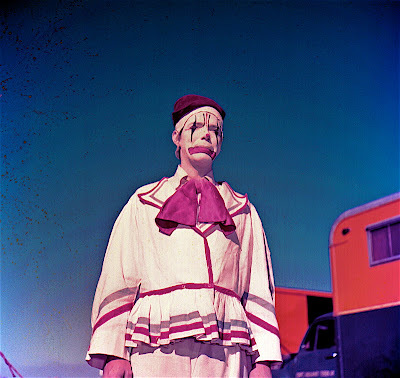 The Hanlons would endure for another four decades, adapting their acts for vaudeville and finally appearing in the Clown Alley of the Ringling Bros. and Barnum & Bailey Circus. In 1979, six American performers sought out the final living descendant of the original Hanlon brothers and asked for her blessing upon their new company, dubbed the Hanlon-Lees Action Theater. This modern incarnation of the original troupe is best known for pioneering and refining a theatrical form of medieval jousting, an event which the company continues to perform at Renaissance festivals in the United States. The modern Hanlon-Lees also performs Western-themed shows such as fantasy rodeos and cowboy exhibitions. Kit Parker Film's Weiss-O-Rama has to be about the most Third Banana-y DVD set I've ever purchased; a collection of late-era silent comedy shorts from the low-budget Weiss Brothers' studio starring Ben Turpin (his last series), Snub Pollard (likewise), Jimmy Aubrey, Bud Duncan, circus clown Poodles Hanneford, and others. Three of the Hairbreadth Harry shorts are also included, letter-perfect adaptations of C. W. Kahles' wonderful comic strip, although, sadly, little is made on the DVD of the series' funny page origins. Of particular interest to me are Poodles Hanneford's comedies. Poodles was primarily famous for his uncanny equestrian act and holds a Guinness record to this day for for performing a running leap onto a galloping horse, and then stepping off, twenty-six times in quick succession. Each of the DVD's three Hanneford shorts include at least a few of Poodles' circus routines, most notably Circus Daze (1928) which features much of his equestrian act, albeit modestly (and unnecessarily) tricked-up. The severely disjointed Fare Enough (1928) stars Poodles in a much more traditional vein as an inventive Keatonesque underdog (and is that an uncredited Arthur Housman as one of the drunks?). While not possessing any great depth of character as a film comic, he's certainly engaging and, frankly, a more impressive and promising all-round talent than more famous names like Ben Turpin and Snub Pollard! A very happy 29th birthday to the man who led the American circus into the "age of blogging" and continues at it's forefront, Mr. Buckles Woodcock. 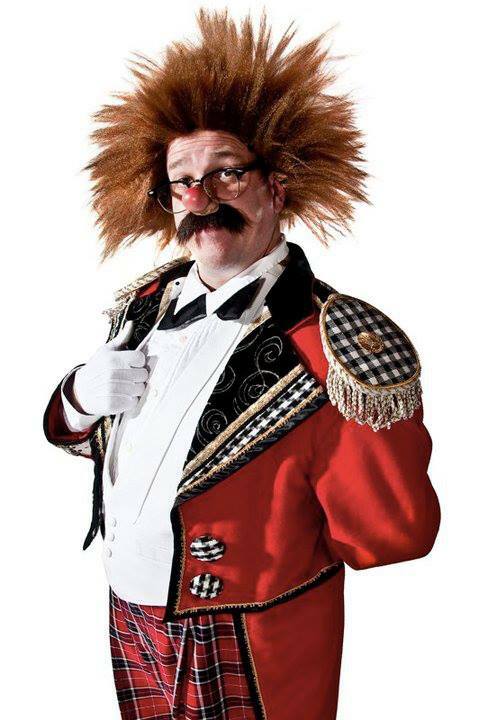 The Kelly-Miller Circus' 2008 season will begin on March 15th in Hugo, OK and the clown from opening day through April Fool's Day, April 1st will be... me! 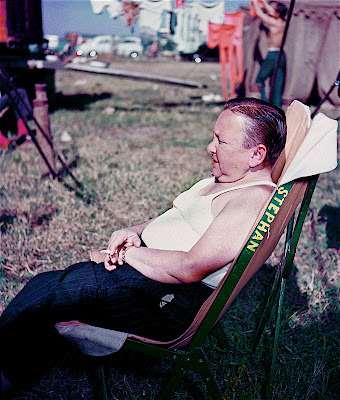 The show, being owned by John Ringling North II, makes me the first American circus clown to work for an actual member of the Ringling family in 40 years! There have also been discussion of me joining the show for some East Coast dates and doing some advance this summer but those are still in the works. So if you are in the Hugo, OK or Dallas/Forth Worth area be sure to come on out and say "hi" and, if you lower your expectations, you might just enjoy some of the classic-style hokey corn that I'll be selling. 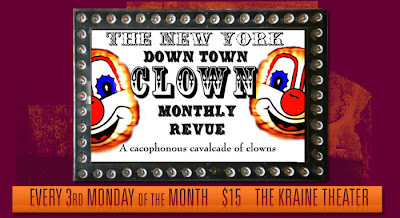 Ladies and gentlemen, clownalley.net will be making a big announcement concerning the clowning on this season's Kelly-Miller Circus at 8:00 PM this evening! Charlie Bell and a canine companion (Trixie? Peanut?) from the series of photos by Janette Rainwater. More from the Janette Rainwater series, these were marked as "Duffy" and look to be Owen McQuade. The charivari (comedy vaulting) act that strongly influenced all others to come, The Stupids. Photo courtesy of Michael Rainwater, article scans courtesy of Bill Strong. 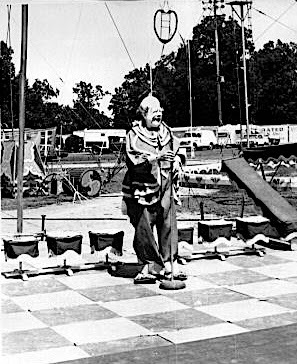 Paul Jung, Nov. 27, 1954 at the Winter Quarters of the Ringling Bros. and Barnum & Bailey Circus in Sarasota, FL by Dr. Janette Rainwater. 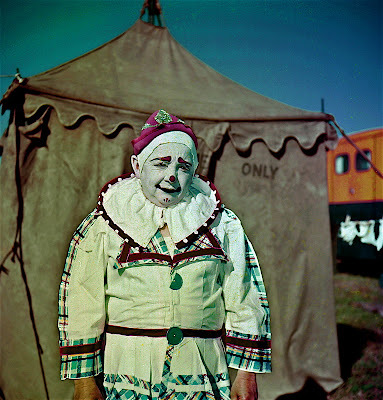 This is one of a series of color photos of Ringling clowns both in and out of makeup that was shot on spec., hoping that they could be sold to Ford Times or Friends (the Chevrolet give-away magazine), but they never found a buyer. The photos have been unseen since. There were a few folks who had asked for a better scan of one of the articles from the other day, there were also some folks who asked why I was posting this unpleasant information at all. 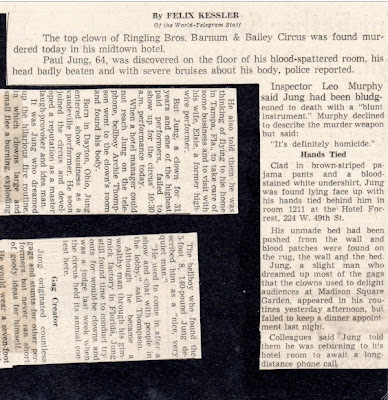 I prefer to remember Paul Jung for the extremely gifted circus clown that he was, not for the sordid details of his passing, but think that this information (as disturbing and awful as it is) is a part of Jung's story and should be told. 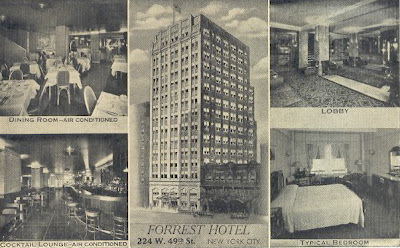 The Hotel Forrest, friendly to musicians, actors and other performers, as it appeared in 1946. A brief glimpse of Doodles the Clown (a.k.a. 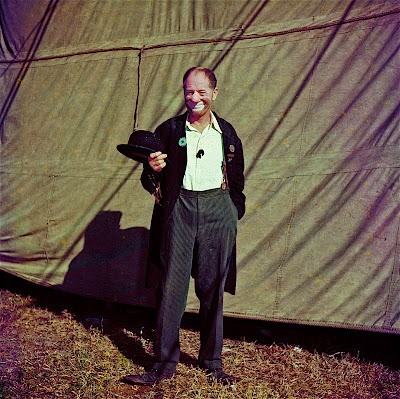 William Lauder McAllister) who appeared at the Blackpool Tower Circus 1915-1944, as well as Hengler's and Zalva's, Kelvin Hall Circuses & Bostock's Zoo. This is taken from the 1934 film Sing As We Go. For more on Doodles please click here. 12×18 grey matboard, original sold.